We recently joined Costco. We were briefly members years ago in Arizona when we first married, and boy has Costco changed since then. I joined expecting to save a few bucks on things like toilet paper, but soon realized there are a lot of organic and natural food options that they didn’t have before! Thank you, by the way, to those of you who gave me suggestions and insight into what you buy at Coscto on my Facebook page. It was so helpful! On my first trip to Costco, I came home with a giant container of organic spinach. I made 30-minute Skillet Spinach Lasagna, I made a lot of green smoothies, and I ate a lot salads. I still had a mountain of spinach left to use. I decided to try and freeze it into cubes for smoothies. I’m pretty sure I’ll be doing this forever and ever because having these handy little spinach cubes, ready to pop into a smoothie, is awesome. It’s so easy to prepare these–it takes just minutes. All you have to do is start with a whole lotta spinach. I used about 8 cups. Puree the spinach. To do this, you simply need to blend the spinach. You can use a blender or a food processor, but I like how smooth the blender makes it. Next, pour the pureed spinach into an ice cube tray. I used the same silicon freezer tray I use to freeze my fresh herbs. Next, you put them in the freezer to freeze. After they are totally frozen, pop them out of the tray and transfer them into another container for storage in the freezer. I wrapped mine in parchment paper and then put them into a Ziplock freezer bag. I wrapped them in parchment paper first to avoid having them touch the plastic bag. I use this unbleached parchment paper , which is made without chlorine. 8 cups of spinach gave me nine 1-ounce cubes of pureed spinach. I use one cube for a large smoothie and it works perfectly! Now even when I don’t have fresh spinach in the house, I can always have some to add to our smoothies. I love it! Now for the Hidden Greens Smoothie recipe. This is for all the moms, dads, or kids who turn their nose up to smoothies that are green in color. What is it about green that makes kids squirm? I tried to give Luke a piece of cooked kale last night and he automatically said, “Noooo! That’s yuck!” *Sigh* At least I have smoothies to get him to eat some greens. This is a classic combination at our house. 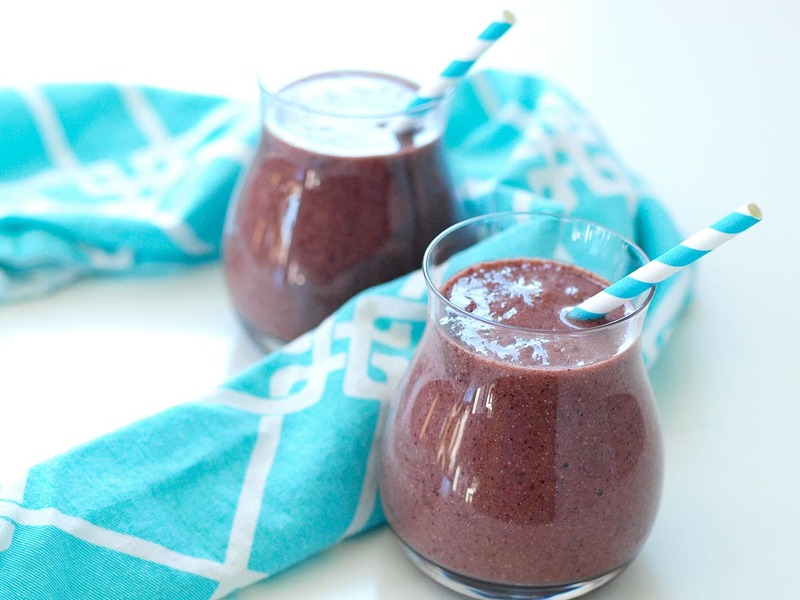 It tastes like a berry smoothie–you can’t taste the greens at all. And the deep purple color of the fruit overtakes the green, so if you have someone in your life who has decided he simply can’t eat green things, this is a great way to ease him into it! 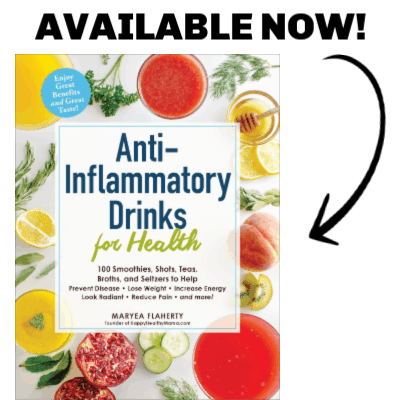 Before I get to the recipe, I want to tell you about a 31 Day Smoothie Challenge I offer. 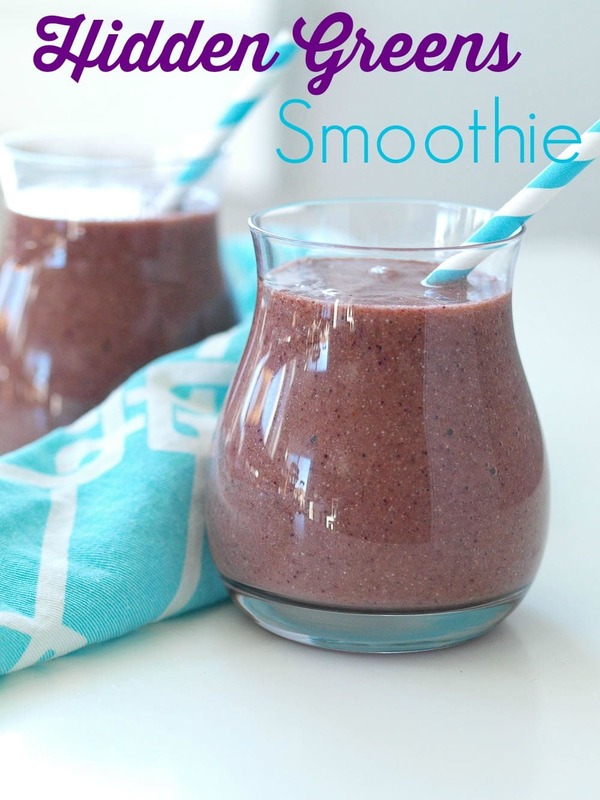 Put all ingredients in the blender and blend until super smooth. Enjoy! This seems like a great way to save time in the mornings! Thank you for sharing! Thanks for sharing! The smoothie looks great! 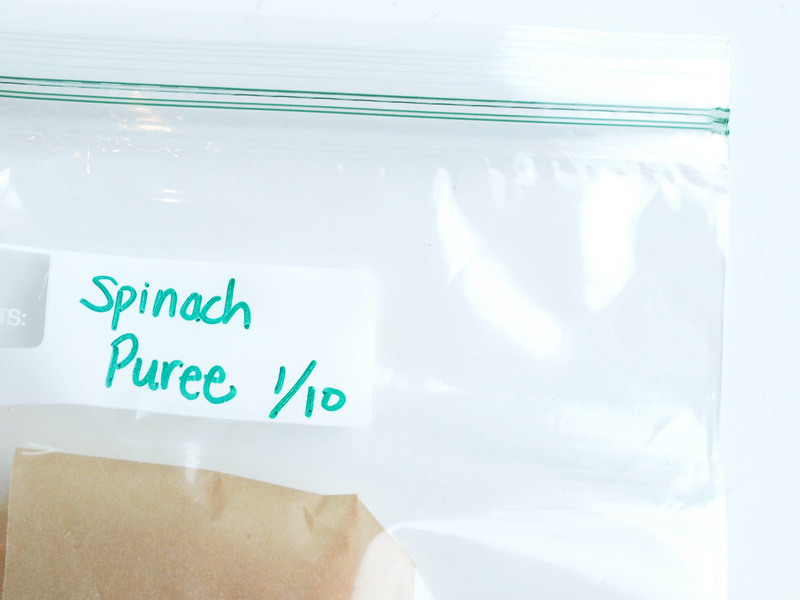 I simply freeze packages of spinach. I just take out of the freezer when I am making my smoothies and throw in a handful and put back into the freezer. Works great! Only downside, is that you don’t want to leave it out of the freezer for long, as it thaws very quickly. That’s a great idea, too! Before this I often would pre make smoothies in mason jars and freeze the greens whole, but I didn’t want to pre make a whole bunch of smoothies this time so thought of pureeing. I like having the purees on hand to throw into whatever kind of smoothies I’m having. Absolutely genius! Truly this is the best idea! I’m loving Costco! Lots of great options and great prices. Great idea! Our Costco is a 1.5 hour drive, but when we get the chance to go you better believe I’m stocking up. Such great stuff at great prices! I’m allergic to bananas–yes, it IS a drag. What could I throw in here instead of the banana? You can add a little more of the berries and then add some honey for sweetness. Or you could add some pineapple instead of the honey as that adds a good amount of sweetness also. Do you add a little water when you blend the spinach , for the cubes ? Thank you. I don’t, but you can if your blender needs a little help. My blender purees the spinach without added water. Do u add any liquid when spinach added to blender? No, I typically do not. If you have enough spinach in the blender and a powerful blender, it creates a puree with no issues. If your blender is kind of weak, you may need to add a little water. I haven’t needed to, though. Awesome site. Nice smoothies. I was wondering how much weighs 1 cup of spinach ? Hi, this is such a great tip but i was wondering how many frozen spinach cubes would be equal to a cup of fresh spinach? Just looking for a guideline when following other recipes. Thanks! This is the best culinary tip I have ever come across! I was constantly having to throw out expensive organic greens that I hadn’t used quickly enough and then being without them until I got to the grocery store to restock. Now I will always be organised and ready for my morning smoothie. Thank you so much!! !